Administration notes; displayed only in the Dashboard. Enable the plan limits, for calls per time period for the quota, to be overriden by the package key, i.e. set personalized limits at the developer level. Enable the plan limits, for queries per second, to be overriden by the package key, i.e. set personalized limits at the developer level. The number of keys that will be active when generated. Any key generated after the moderation threshold is reached will have to be approved by the administrator. This option enables developers on your company portal to generate and issue keys to themselves without assistance from an administrator. The process for a developer self-generating/issuing a key occurs during the application registration workflow within the portal. During the application registration workflow, the developer chooses from a dynamically generated list which API Package Plan he will register his application against. If the is_public field is set to "true" for a specific Package Plan, then that Package Plan will be included in the list that the developer can choose from when registering an application. Once the application is registered, the key is automatically generated and issued for the developer for the selected Package Plan. This setting controls whether or not keys will be automatically enabled or require review and manual approval through the Dashboard or API. Each limit object describes a particular type of unit. A limit object has three fields. The time period applicable for the limit. Possibile values are second, minute, hour, day, month. Where the limit is defined in the mashery system. Possible values are "key" or "service"
Maximum number of events that can occur in the specified time period. A Plan has one or many one related Limit objects. The related Limit objects can be accessed directly via the object.query API method by including this relationship in the query, e.g. select *, limits from plans. A Plan has one and only one related Package object. The relationship is indirect via the Plan object. The related Package object can be accessed directly via the object.query API method by including this relationship in the query, e.g. select *, package from plans. 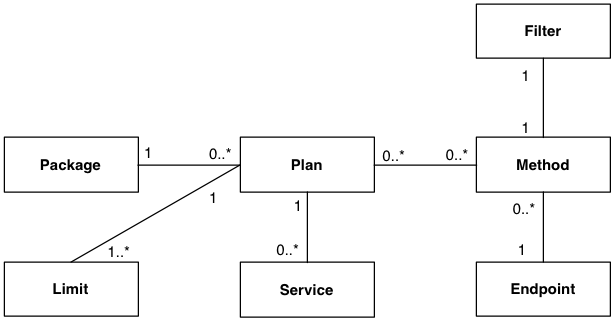 A Plan has zero or many related Plan Service objects. The related Plan Service objects can be accessed directly via the object.query API method by including this relationship in the query, e.g. select *, plan_services from plans. A Plan has zero or many related Plan Endpoint object. The related Plan Endpoint objects can be accessed directly via the object.query API method by including this relationship in the query, e.g. select *, plan_endpoints from plans. A Plan has zero or many related Plan Method objects. The related Plan Method objects can be accessed directly via the object.query API method by including this relationship in the query, e.g. select *, plan_methods from plans. A Plan has zero or many related Plan Filter objects. The relationship is indirect via the Plan Method object. The related Plan Filter objects can be accessed directly via the object.query API method by including this relationship in the query, e.g. select *, plan_filters from plans. The plan namespace contains the following methods for manipulating services. Get a specific plan or a list of plans . Accept a plan specification and clone that plan.